Vacation rental condominium. Sleeps 11, 4 bedrooms, 3 bathrooms. No pets allowed. Whispering Pines condo #WP524 is calling you to enjoy a guys weekend retreat or girlfriends getaway in the Smokies! This 4-bedroom, 3 bath rental is ideal for gathering a group of friends or multiple couples so that everyone can have a luxury vacation at a bargain rate. Each bedroom has a king-sized bed, flat screen TV, and ceiling fan. The master bedroom also has a Whirlpool tub. Unit features complimentary Wi-Fi, a kitchen with full size appliances and bar seating for 3; dining area including a desk and chair; living room with leather furniture, seasonal fireplace, and large flat screen TV; and balcony with outdoor table. Very clean, large rooms and friendly staff!! Will definitely recommend and stay again. Thank you so much for staying with us at Whispering Pines! We're happy to hear that you all enjoyed mountain view condo 524. We truly appreciate you and your kind comments regarding the cleanliness and our wonderful staff, they mean a lot to us. 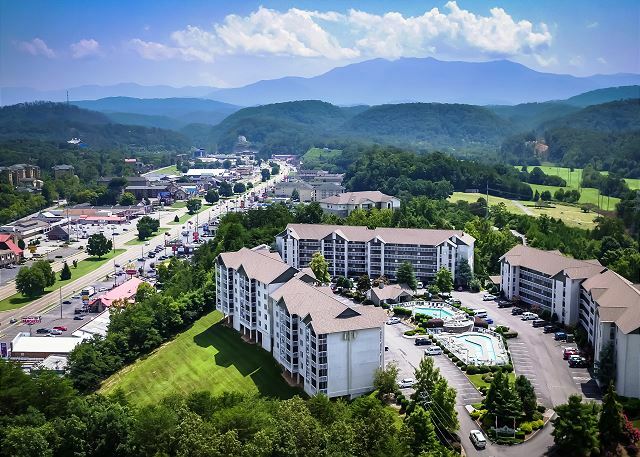 We welcome you to vacation with us again the next time you're visiting beautiful Pigeon Forge! Clean, upscale condo. Spacious, close to great restaurants. Thank you so much for staying with us Whispering Pines! We greatly appreciate your review; we're glad to hear you enjoyed the condo and found it conveniently located. We welcome you back to stay with us again soon! Enjoy staying at Whispering Pines when in Pigeon Forge. Kids really enjoyed the pools. Hope you and the kids made many memories while visiting Pigeon Forge. Thank you for choosing to vacation with us time and time again. We appreciate you and look forward to having you all back the next time you are in the Smoky Mountain area. Thank you so much for staying with us at Whispering Pines! We are so happy to hear that you and you family enjoyed the condo. Also, that everyone was comfortable with plenty of room, and were pleased with the location as well. We welcome you and your whole family back to see us again soon! Always love this resort. Some of the condos need updating but are always clean and in a great location! Thank you for your patronage and that you always love our resort and the location! All our units are individually owned and decorated. You may look online and view each unit so you can find the perfect one that fits your personal taste; call us and let us know your preference and we will be happy to book it for you. We look forward to your return the next time you're in Pigeon Forge. We are very pleased with Whispering Pines. We are 10 sisters ranging in age 72 to 92. We rent units 523 and 524. The management is very helpful and did whatever they could to make us comfortable. This was the third or fourth year we have stayed at Whispering Pines and hopefully we will be back next year. Oh, we love having you all stay with us! Ya'll are fantastic and it's so good to see you upon arrival. Glad to hear you all enjoyed another trip here at Whispering Pines. We certainly hope to see you all again next year! Great comment. We appreciate your visit and hope you will visit us again in the near future. Our high school baseball team stayed at Whispering Pines while participating in a local tournament mid-March 2018. Everything about the stay was perfect - the rooms, the location, the amenities...everything. I would highly recommend Whispering Pines to ANYONE who wants a home away from home experience while visiting the Pigeon Forge area. You simply cannot beat it. Thank you very much for staying with us and for the kind words! We appreciate you and we look forward to seeing you again next time you are in town. We had never stayed at Whispering Pines Condos before but this trip we needed 4 bedrooms. The condo was very spacious with 3 bathrooms 2 with Jacuzzi tubs. Tvs in bedrooms and great amenities, like heated pool, free dvds which was great for kids in winter. All the staff was very helpful if they didn't know answer they would go out of there way to find it. The only negative was the Wi-Fi or lack of Wi-Fi. RPM has very nice condos we have also stayed at Bear Crossing before, very nice also. It is nice to see that you have stayed at 2 of our 3 properties in Pigeon Forge. We appreciate your great review and comments. We apologize for the Wi-Fi issues. We usually have good service but there is an occasional issue. Again, please accept our apologies. Always let us know so that the carrier can be contacted. We appreciate your patronage and look forward to your return. Happy Holidays! great place to stay, central location, condo was clean, two pull-out sofa/chair beds. NOW.., the chair bed needs linens and pillows, and a few more washcloths. But otherwise a good place to stay, for a weekend get-away. Thank you so much for staying with us and for the feedback! We appreciate you! We are glad you all enjoyed your stay with us and we hope you can come back and see us again soon! The staff is very courteous and the Condo was very clean. The only issue we had was the noise from the people in the condo above us it was as if they moved furniture all hours of the night. Great! So glad you all enjoyed your stay except for noisy people! I am sorry about that! Please let us know anytime you have issues at all during your stay and we will address them as soon as possible! We hope you all will come back and see us again soon! Amazing! We love hearing that your family vacation was enjoyed by everyone. We welcome you back to stay with us again soon. We had a wonderful time. Loved the condo and the lay out. Had enough room for everyone and they had their own space. Kids loved the pools. Exceeded my expectations. So pleased to hear you enjoyed your first trip to Pigeon Forge! We hope you made a lot of fun memories and hope to see you again soon! Awesome! Thank you so much for staying! Come back and see us again soon for more amazing-ness! We appreciate your visit, perfect review, and comments. We are glad that you had an enjoyable vacation with us and will visit us again. Thank you so much! Come back and see us anytime! Thank you for vacationing with us in one of our 4 Bedrooms. Glad to hear you enjoyed your trip! We will mention your comment about the cloth chairs to the owner of that condo. Again, thanks and come back soon! We love staying at whispering pines! We enjoy the home atmosphere!!! Great times! We will be back!!! Awesome sauce! Thank you for the kind words! We are happy you enjoyed your stay! Come back again anytime! We rented two condos and had a great week. Management was very helpful and accomodating. Hope we can return next May to same condos. Thank you for choosing Whispering Pines for your sister trip to Pigeon Forge. We are so glad to hear that you had a wonderful experience with us. We appreciate your kind words and wonderful review. We welcome you back to stay with us next May if not sooner. We stay at Whispering Pines every time we go to Pigeon Forge. They are very clean and offer great discounts to some local attractions. Thank you so much for your wonderful review. We are glad that you enjoy staying with us and that you were able to take advantage of amenities that we offer. We hope to see you again soon! We went to the Smokey's for a family getaway. We couldn't have been more pleased with the condo. The people at the resort were very friendly and helpful!The condo was super clean and well furnished. We can't wait to return to this condo next time we come to Pigeon Forge! Thank you so much for all the kind words! We work very hard to make sure our guests have the best experience possible. So glad you enjoyed your stay, come back and see us again soon! Always a great place to stay. Well kept, helpful and friendly staff and perfect location for our winter retreat. Thank you so much for staying with us! We appreciate you! We are happy you enjoyed your stay and we hope to see you again soon! Thank you very much for your complimentary feedback of our resort and staff members. We are so glad that Whispering Pines was the perfect location for your stay during the youth conference. We appreciate you and hope to see you again soon! This was our first time to stay with this company. Wonderful place! Very family friendly and great location to all local attractions! Will definitely be back!! Great! Glad you enjoyed your time with us and thanks for being a first time guest! Hope you can call us home again next time you are in town! We were traveling with a 6 month old baby so it would have been nice to have had a rocker/recliner to rock him in. Getting him to sleep at night was a challenge without a rocking chair which he is used to. Otherwise, no complaints. Thank you for staying with us! Next time you book please let us know you need a rocker and we will make sure you stay in a unit that has one. Hope you can stay with us again soon! Our family thoroughly enjoyed our stay. Wonderful! We are so happy that you & your family enjoyed your stay with us. We hope that you will visit us again when in the Pigeon Forge area! It was great even though we had to wait to get in the room. The only negative was our feet got dirty from walking on the carpet. I would recommend to the owner that it replaced with some other type of flooring. Very close to dolly wood and would stay again. Thank you for staying with us! Summer time is the busiest time of the year for us and we try our best to get the units ready for our guests as fast we can......come visit again soon! Location of condo was very peaceful and a great location to all attractions. The pools were very clean and warm. The condo fit our needs with 3 bathrooms, 4 bedrooms, and a family rooms were we all could gather. The staff was very friendly. Thank you for staying with us at Whispering Pines. We are glad to know that you enjoyed condo 524 and that you were able to enjoy the pools during your stay. We appreciate your kind comments regarding our staff. Thank you for your business and we hope that you can visit us again. Our family has been coming to Pigeon Forge for the past four years after Christmas. Whispering Pines is our choice of places to stay. The four bedroom condo especially fits our needs. That way we can all be together. Thank you so much for making our stay the best!!! Oh, we are so glad you are able to come to Pigeon Forge yearly with your family and that you chose to stay in one of our four bedrooms this year! Thank you so very much for vacationing with us. We hope to see you in 2016! We are so happy to hear that you enjoyed your stay. We hope that you can visit us again soon. MY FAMILY'S QUICK WEEKEND GET AWAY! WOW! Thank you for spending your weekend getaway with us at Whispering Pines. We appreciate you and hope to that you can visit again soon. As always - AWESOME! My husband and I vacation their quite oftern. This time we brought our Church for a retreat/training seminar. Everyone in attendance loved the rooms (534 & 524); and the facility as a whole. Thank you for a great time! Thank you for visiting Whispering Pines Condos in Pigeon Forge, Tennessee. Glad your visit was awesome. We love the smokies and have never found a better place to stay. It is clean, spacious and if we have any problem they take care of it immediate. All of the staff was very friendly and professional. I would highly recommend this set of condo's. I have stayed in 4 different condo's and they were all equally nice. Thank you for being a loyal repeat guest with us a Whispering Pines Resort. We appreciate your wonderful review and hope to see you again soon. Perfect place for our family trip. My family was very pleased with the accomadations. The office staff was very friendly and helpful. I definitely would recommend Whispering Pines to friends and relatives. Thank you for your review and recommendations to your friends and relatives. See you again at Whispering Pines Condos in Pigeon Forge, TN unit 524. We were very satisfied. Enjoyed it very much. Staff was very accomodating. We are pleased to hear you enjoyed your stay with us at Whispering Pines! We appreciate your patronage and look forward to your next visit. Great location; Room clean; great customer service; would definitely stay there again. We are happy you enjoyed your experience at Whispering Pines! Nice condo, however the sofas were extremely uncomfortable and very worn. These should be replaced immediately. We liked the location and the management company was polite and helpful. Thank you for staying with us in one of our four bedroom condos. I am sorry you weren't able to enjoy the sofas. I will let that condo owner know so they can look into replacing them. A lot of our owners aren't able to make it to their condo often so unless a guest brings it to our attention we can't let them know if their furniture is uncomfortable so thank you for letting us know. If you have any other suggestions please let us know. Again, thank you for staying and we do hope you are able to return in the near future! We appreciate your loyalty so very much and are so happy to hear that you all have a wonderful time each time you stay with us. Until next time! Happy Holidays! Love to stay here. We get this same condo 2 times yearly. Need better trash bags. We cook a lot and trash bags were terrible. Thank you for being a loyal guest of ours here at Whispering Pines. We appreciate you so much! I pass your comment about trash bags on to our housekeeping department so they can look into possibly getting different ones for our guests. We appreciate you telling us about your stay and hope to see you again soon! Enjoyed our stay. Would like to have another bathroom as it was unhandy sharing with another couple. Thank you for staying with us for the NQC. We are happy to hear that you enjoyed your stay. We suggest during your next stay that each party would try a smaller condo such as a two bedroom two bath, this way everyone has their own bath. All of our four bedroom condos have three baths. We would be happy to help you find condos that fit your need. We appreciate you and look forward to seeing you again. Thank you kindly for staying with us in Unit 524! We appreciate you taking the time to write this review. Please come stay with us again.